I've updated my website to include show photos from Jesus Christ Superstar at Moorhead High Theatre and Red at Theatre B. Click on the images below for more! When the design concept started to center around arena rock there were a few things ideas that immediately popped into mind. I wanted tight beams of light, haze, and the intense white light that the HMI fixtures typical of rock tours put out. The photo above (taken by Robby Njos for our billboard advertisement) shows all of this in one shot. To accomplish this we use four sets of ACLs (short for Air Craft Landing lights), and 24 moving lights with the color set to 5200 Kelvin, four HMI followspots, and conventional sidelight gelled with color correction gel to mimic that color. The ACLs use sealed beam lamps which produce a 5 degree beam angle. They are in sets of four near the top of the photo. The Robe Robbin 100 LED Beam is a close second when it comes to narrow beams. Its 7 degree beam angle looks to be almost parallel in haze (see photo below, also from Robby Njos). They are fast, bright, and have the narrow beam that looks great in haze. For Minnesota State University, Mankato's production of A Chorus Line, the scene designer and I collaborated to put some extra pop into the periaktoi by incorporating light boxes into them. There a 5 periaktoi with 6 segments each, for a total of 30 segments, all of which are individually controlled. 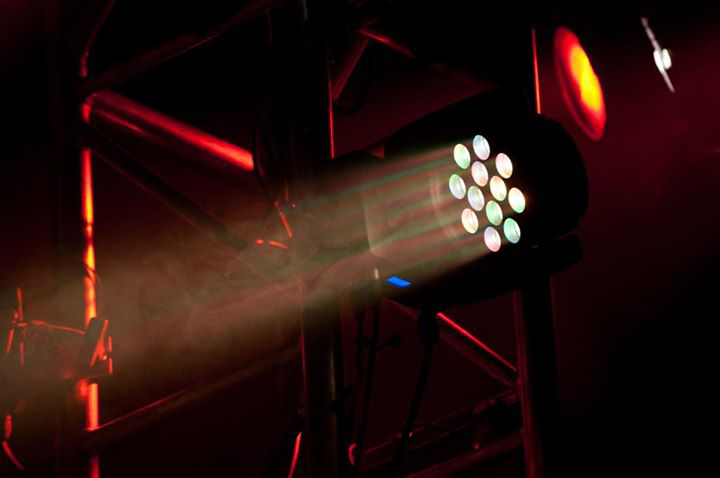 The fixtures used are ETC Vivid-R 11" fixtures with V40 and H40 lenses. 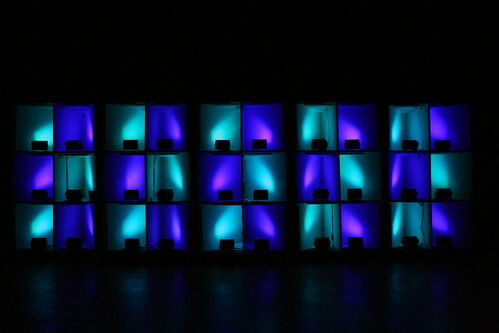 The effects possible with this arrangement are nearly limitless, and range from a solid wall of light to dynamic effects which a reminiscent of disco, except that the effect can change multiple times during a song. While the technology is new, the effect does not seem out of place in the 1975 musical. Wiring the periaktoi provided a unique challenge, as the units needed more than 360 degrees of rotation ability. To facilitate this, data is distributed via a optical splitter on the batten above to allow each unit to be fed data without needing a return. Each periaktoi was also fed with its own dedicated 20 amp circuit. The cables were dropped through a hole in the top of each unit and gravity kept the cables taught enough to not be a distraction while still allowing the unit to rotate freely. At the end of each rehearsal and performance, the crew rotates the periaktoi to remove any twists in the cable. Programming the effects was simple with the ETC Eos, even though the lights used 240 channels of DMX. Step based effects, color effects, and linear effects are all used throughout the show, sometimes cross-fading directly between two different effects seamlessly.